Pantropical species, is present in nature in Australia (Northern Territory and Queensland), Belize, Brazil (Bahia, Paraná, Pernambuco and Rio de Janeiro), Cayman Islands, China (Guangdong, Hainan and Hong Kong), Colombia (Choco and Valle), Cook Islands, Costa Rica, Cuba, Dominica, Dominican Republic, Ecuador (El Oro, Galapagos Islands and Manabi), Fiji, French Polinesia (Marquesas Islands and Society Islands), Guam, Guyana, Honduras, Indonesia (Java and Sumatra), Ivory Coast, Jamaica, Kenya, Liberia, Madagascar, Maldives, Marshall Islands, Mauritius, Mexico (Chiapas, Guerrero, Jalisco, Michoacan, Nayarit, Quintana Roo, Tamaulipas and Veracruz), Micronesia (Pohnpei), New Caledonia, Nicaragua, Niue, Northern Marianas, Palau, Panama, Papua New Guinea, Philippines, Salomon Islands, Samoa, Seychelles, Singapore, South Africa, Surinam, Tonga and Vanuatu, where it grows along the coasts, on mainly sandy soils, up to about 300 m of altitude. The name of the genus comes from the Latin “hibiscum”, name utiized by Pliny (23-79) to indicate the Althaea officinalis, in its turn coming from the Greek “ἰβίσκος” (ibiscos), referred to some Malvaceae; the specific name is the Latin adjective “tiliaceus, a, um” from “tilia” = linden, as the leaves resemble to those of the Linden (Tilia europaea L.). Common names: beach hibiscus, mahoe, sea hibiscus, tree hibiscus (English); algodão da praia, uacima da praia (Brazil); huang jin (China); vau, vau ndina, vaundra (Fiji); bago, lambagu, malubagu (Philippines); yama-asa (Japan); waru (Java); pago (Guam); fau maoi (Marquesas Islands); lo (Marshall Islands); ayiwo (Salomon Islands); tin ban (Myanmar); vole (New Caledonia); hibisco maritimo (Panama); bang (Papua New Guinea); fau (Samoa); po fai, po na, (Thailand); purau (Tahiti); fau (Tonga); burau (Vanuatu). The Hibiscus tiliaceus L. (1753) is a very variable evergreen shrub or tree, ramified, 3-12 m tall, with ample roundish crown and trunk, up to 50 cm of diameter, with pale grey bark, smooth in the young plants, brownish and deeply fissured in the old specimens; the young branches are covered by a thick and short down. The leaves, arranged spirally on a 3-12 cm long petiole, are simple, almost ovate with cordate base, entire or slightly crenate margin and abruptly pointed apex, 5-20 cm long and 6-18 cm broad, coriaceous, almost glabrous above and of intense green colour, grey-green and pubescent below. Bisexual flowers, on a 1-3 cm long pedicel, axillar, solitary or grouped at the apex of the branches with reduced leaves, ephemeral, initially of yellow colour, with or without dark purple spot at the centre, turning orange or red-orange before falling. Cupuliform epicalyx, 0,5-1 cm long, with 7-10 lobes, united for half of the length, triangular with pointed apex and covered by thick greyish down. Campanulate calyx, 2-3 cm long, with 5 lanceolate lobes externally pubescent, campanulate corolla, of 5-10 cm of diameter, with 5 obovate petals, 4-6 cm long and 4-5 cm broad, and staminal column about 3 cm long. The fruit is a woody ovoid capsule with 5 valves, 1,5-2 cm long, containing numerous reniform seeds, about 0,4 cm long, of dark brown colour, wrinkled. The seeds float and remain viable in seawater for months, and this has contributed to its vast diffusion. It reproduces by seed, that is to be previously scarified and immersed in water for one day, in draining loam maintained humid at the temperature of 25-28 °C, with germination times of 15-30 days and first blooming after 2-3 years, but usually by woody cutting, 20-40 cm tall and of about 2 cm of diameter, directly in the ground or in nursery, that easily roots and usually blooms within a year. In order to realize barriers quickly, we can use portion of branch up to 3 m long and interred for about 1/3. Species of easy cultivation and fast growth, is employed mainly for ornamental purposes, due to the foliage and the almost continuous blooming, in the tropical and subtropical climate regions, not bearing temperatures just under the 0 °C unless exceptional and short lasting, as isolated specimen or in group, as shade tree and in the road trees; it stands very well the prunings, even drastic, done for keeping compact its habit. It is also utilized for realizing windbreaking barriers and, close to the sea, as protection of the marine aerosols, in programmes of reforestation and in the stabilization of sandy soils thanks to its vast and superficial rooting apparatus. It requires full sun or slight shade and is not particular about the soil, even if poor and little draining, from slightly acidic to slightly alkaline, but grows best in the sandy and rich of organic substance ones. Cultivable also in pot, with suitable prunings, for the decoration of open spaces and, in the less favourable climates, of verandahs and particularly luminous winter gardens; is also an excellent subject for bonsai. Locally the flowers are consumed as vegetable or fried in batter. With the fibres gotten from the bark, that present excellent characteristics of resistance and duration in the seawater, they realize cordages, fishing neys, mats and handicrafts. The wood, light, porous, easy to work, is utilized in carpentry, for palisades, tools, small boats, in the fabrication of paper and of plywood and as fuel. Bark, flowers, leaves and roots contain numerous bioactive compounds and are utilized in the traditional medicine for various pathologies. Synonyms: Hibiscus tiliifolius Salisb. (1796); Hibiscus abutiloides Willd. (1809); Hibiscus circinnatus Willd. (1809); Pariti tiliaceum (L.) A. St.-Hil. 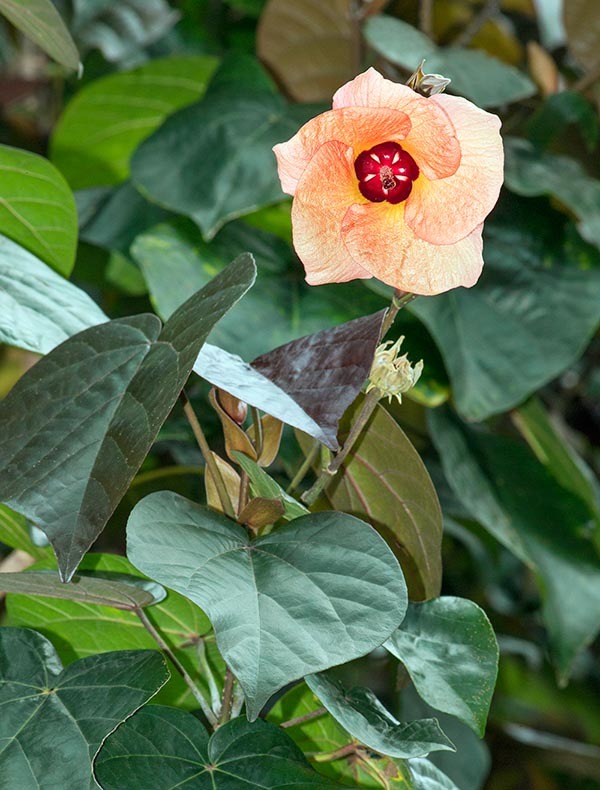 (1825); Hibiscus tortuosus Roxb. (1832); Hibiscus tiliaceus var. tortuosus (Roxb.) Mast. (1872); Hibiscus tiliaceus var. abutiloides (Willd.) Hochr. 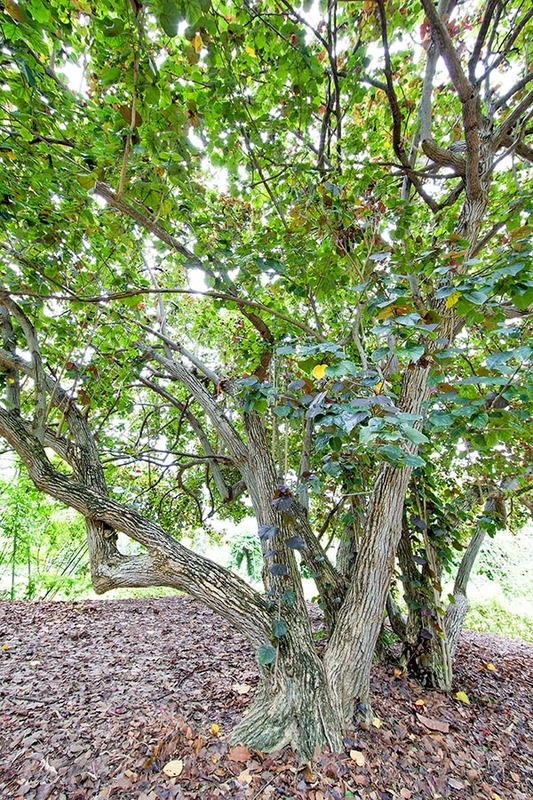 (1914); Hibiscus porophyllus Vell. (1825); Paritium tiliaceum (L.) A. Juss. (1825); Paritium tiliaceum (L.) A. St.-Hil. (1825); Paritium abutiloides (Willd.) G. Don (1831); Paritium circinnatum (Willd.) G. Don (1831); Paritium tiliaceum (L.) Wight & Arn. (1834); Paritium elatum var. abutiloides (Willd.) Griseb. (1864); Hibiscus boninensis Nakai (1914); Pariti tiliaceum (L.) A. Juss. (1920); Pariti boninense (Nakai) Nakai (1936); Talipariti tiliaceum (L.) Fryxell (2001), Talipariti tiliaceum var. pernambucense (Arruda) Fryxell (2001).